This recipe is so easy, yet so tasty and full of flavor, nobody but you will know how easy it was. It's one of my favorite way to do pork chops because it produces a wonderfully tender and delicious chop. I like to do this low and slow in the oven, but you can also finish it on the stovetop on a low simmer if you prefer. Just follow the recipe all the way to deglazing the pan, and then return the chops to the skillet, cover and simmer on low until done. Preheat oven to 325 degrees F. Heat oil in a large lidded stainless skillet. Dry the chops well and add to skillet, sprinkling the top side with salt, pepper and Cajun seasoning; brown. Turn, sprinkle the other side with seasonings, brown; remove to a baking dish. In the same skillet, break the onion into rings and saute in the pan drippings until lightly caramelized. Add the broth to the skillet and deglaze. Pour the entire contents of the skillet over the chops, spreading the onions evenly over the top of the chops; sprinkle with the thyme. Cover and bake at 325 degrees for about 30 to 35 minutes or until tender and cooked through. Actual time will depend on size and thickness of pork chops. Spoon pan sauce over individual servings. For the Skillet: If you prefer, prepare as above, cover, reduce heat to a low simmer and continue cooking on the stovetop for about 20 to 30 minutes, or until tender and cooked through. Time will depend on the size and thickness of the pork chops. Spoon pan sauce over individual servings. BBQ Pork Chops: Season and brown as above and top chops with onion. Deglaze pan with 1 cup water, add 3/4 cup ketchup, 1 teaspoon yellow mustard, 1/2 teaspoon hot sauce, 1 teaspoon paprika, 1/2 teaspoon chili powder, 2 tablespoons each brown sugar, Worcestershire sauce and apple cider vinegar. Pour over chops and bake as above. I also like to add a splash of Kitchen Bouquet and Liquid Smoke, both pantry items for me. Pork Chops and Gravy: Prepare as above, except dredge chops in flour and shake off excess before browning. Transfer to a casserole dish, brown onions and add to casserole dish. Drain off excess oil. Omit beef broth, add one can cream of mushroom soup with one soup can water to the skillet and whisk to scrape up browned bits. Pour the entire contents of the skillet over the chops, Cover tightly with a double layer of foil and bake at 350 degrees for about 45 minutes. Pork Chop and Potatoes Variation: Prepare as above except increase broth to 2 full cups and whisk 2 tablespoons of all purpose flour in with the broth until well blended. Peel and rinse 4 medium sized potatoes and slice fairly thin. Butter a casserole dish and add a layer of half of the potatoes, 1/3 of the broth and 1/3 of onion mixture; repeat layers placing chops on top. Pour remaining 1/3 of broth and onion on top. Cover tightly with a double layer of aluminum foil and bake at 325 degrees F for about 45 minutes, or until potatoes are tender. Actual time will depend on how thick you cut the potatoes. 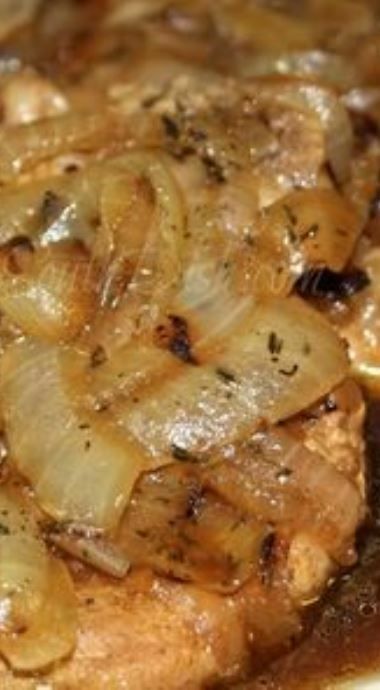 0 Response to "Easy Pork Chop and Onion Bake"